Do you suffer from a respiratory condition? Do you have trouble breathing? Do you often get lung infections? If yes to any of these questions, Saltair is right for you. It dilutes mucus, making it much easier to clear any trapped debris and/or pathogens within the lungs. It has anti-microbial, anti-fungal and anti-viral effects, helping the body kill or neutralize any invading pathogens. It decreases inflammation and helps regulate a proper immune response within the lungs. It helps to normalize blood pressure and increases well-being. This machine is an affordable and small device, making its use anywhere in your home effortless. Its small size makes it easy to place anywhere, and its light weight and easy setting makes it easy to move around. This allows you to move it to living areas during the day, and to your bedroom at night, if necessary; however it is more indicated to have two separate devices for living room / office and bedroom. Additionally, the Saltair device is completely silent, so you can ensure it will not disrupt your sleeping. With the salt particles being released throughout the day or night wherever you may be close to the unit, you get your therapy without even knowing or feeling that it’s even happening. Salt therapy is a natural treatment and it has NO side effects. When using a salt machine, not only are you getting very many health benefits, but you are not harming your body in any way, as there are no side effects and no negative interactions. The negative ions of salt generated by the Saltair machine neutralize the airborne pollutants and allergens, cleansing also the air you breathe. Your whole family can benefit from the wonderful benefits that salt therapy can offer. It is recommended in all ages, from acute to chronic respiratory diseases, including in snoring and healthy individuals. Salt therapy strengthen the respiratory immunity and it is highly recommended in family with kids. This therapy’s positive effects are cumulative, resulting in a much stronger positive response with more use. Considering how practical use of the salt machine is, achieving this maximal response is very doable. Whether you are suffering from a chronic or acute respiratory illness, this therapy is an amazing way to feel yourself again. 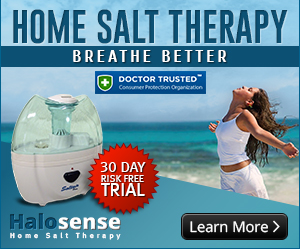 From something as simple as the common cold, to severe respiratory conditions such as cystic fibrosis, breathing easier and feeling better seems too good to be true, but salt therapy makes it very possible. Chronic Obstructive Pulmonary Disease: Please Help Me Breath! we are located in Canada and the price for Saltair is $119.99 CAD and we do ship to Canada and all USA and International as well.